…Specifically, I’ll explain what this piece of equipment is, the exercises you can do with it, its benefits and why it should be an integral component in your training. So, what are power racks and why should you be using one? Good question. Read on. What Exactly Is a Power Rack? 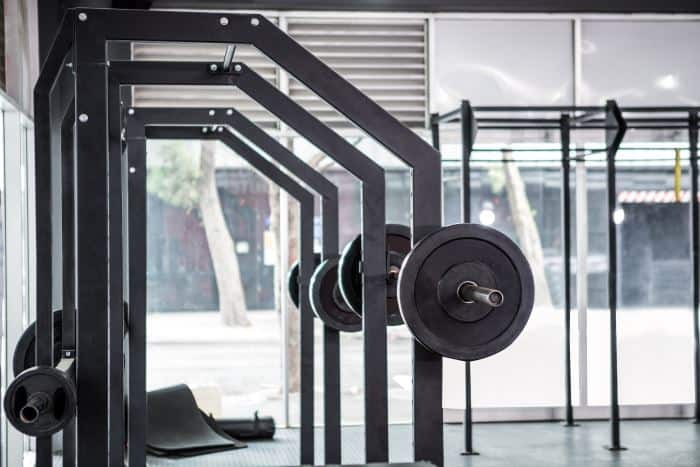 A power rack is a large, rectangular cube-shaped piece of equipment made from steel (see a pic of mine, on the right), which allows you to efficiently and safely perform any number of heavy barbell exercises. It has adjustable pins that you can move to the appropriate height for a given exercise. It also has safety catches that prevent the weight from going beyond a certain point. As you could imagine, this safety feature would come in handy if you were to lose control of the bar or fail at the bottom of a rep. If you know you want to buy a power rack (assuming you don’t have one now), then I highly suggest reading my guide: How to buy the best power rack for your home gym. If you already know what you’re looking for and are ready to start shopping around, then check out the link in the box below. My Advice: Shop for power racks on Amazon to find the biggest selection & best deals. If you’re looking for very specific power rack features or deciding between different models, then you absolutely need to check out my power rack comparison chart. Maybe you’re not even convinced that you need or want a power rack? If that’s the case, then continue reading to learn about the benefits of power racks. Benefits. Here is a breakdown of the major benefits realized from using a power rack. No Need for a Spotter. If you train alone, it’s imperative that you do so safely. 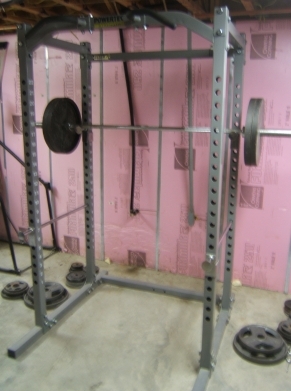 A power rack provides just the kind of safeguards that you need to when moving heavy weight without a spotter. Sure, you could use a regular squat rack (i.e. half rack), but these generally don’t have adjustable safety catches. This prevents you not only from doing deeper or shallower squats, but from doing any other exercises in it, altogether. The only other option would be squat stands, which are typically used by Olympic lifters. However, those aren’t as safe or as versatile as a power rack (or even a squat/half rack). Peace of Mind → Greater Confidence. The best part of power rack training is not simply that you are safer, but rather the peace of mind that comes from that. That is, you can add that extra five pounds to the bar or attempt to push through one more repetition, because it’s guaranteed that you won’t end up pinned under the barbell! Target a Precise Range of Motion. Since you can adjust the safety catches to any height, power racks give you the ability to precisely train any part of the full range of motion on a given exercise (e.g. partial reps). Plenty of Great Exercises. While you can’t do every single exercise known to man with a power rack, you can certainly do the most important ones (i.e. heavy barbell movements). Plus, there are ways of increasing the number of exercises that can possibly be done in your power rack, by having certain equipment options included in, or added to it. See the section below for more information on exercises. Expanded Exercise Choices. But since many power racks also come standard with pull up and dip bar attachments, you can also do these exercises (as well as any of their variations). I’ve probably missed a few exercises, but this gives you an idea as to what’s possible with a good power rack. …Or you can bypass the whole hassle of going to a commercial gym by simply buying your own weight training equipment to build a home gym, complete with a sturdy power rack. That’s what I did. The upfront cost is a bit expensive, but it’s saves you time (no commute) and money (no membership fees) in the long run. 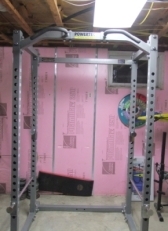 If you decide to go the home gym route and are looking for a power rack recommendation, then look no further: I suggest the Powertec P-PR (image on right). I’ve had one of these bad boys since late 2008 and have since been completely satisfied with my purchase. My only regret is that I didn’t get it earlier, since I had been squatting on a rickety, old Gold’s Gym “quasi-squat rack/all-in-one home gym” that had terrible stability and no safety catches whatsoever. I had long since grown out of it and was overdue for the upgrade.